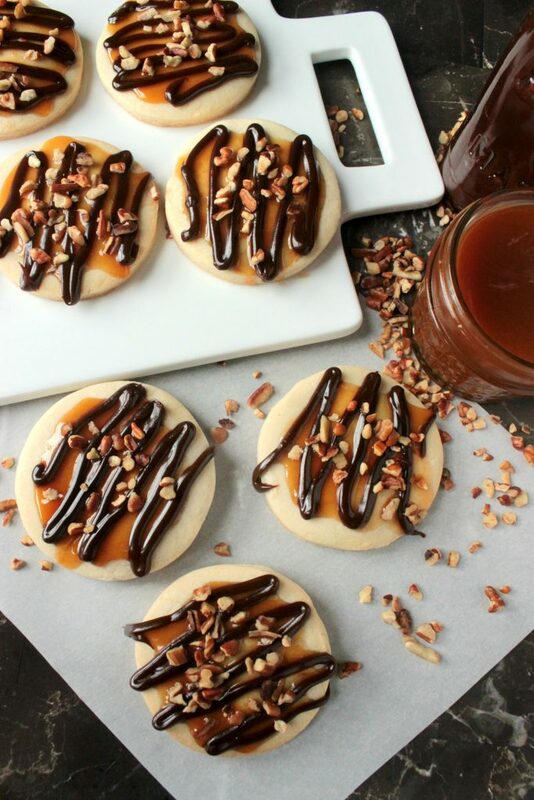 These Turtle Shortbread Cookies are homemade shortbread cookies have a caramel sauce center, they’re drizzled with homemade chocolate sauce and topped with chopped pecans! My husband loves shortbread cookies. While I’m all about #TeamChocolateChipCookie and anything with caramel, he’s always been about shortbread or snickerdoodles. I’m not sure if he could choose between the two if he needed to. 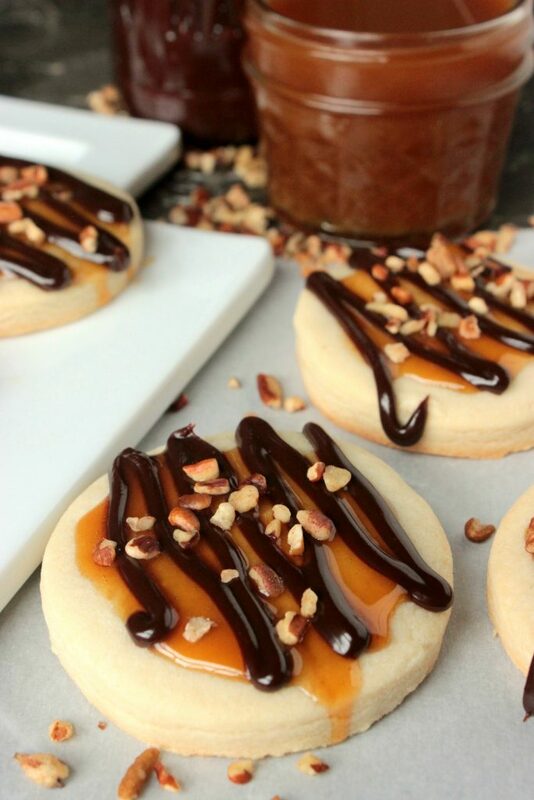 So today I’m kind of combining his love of shortbread cookies and my love of cookies with chocolate and caramel. 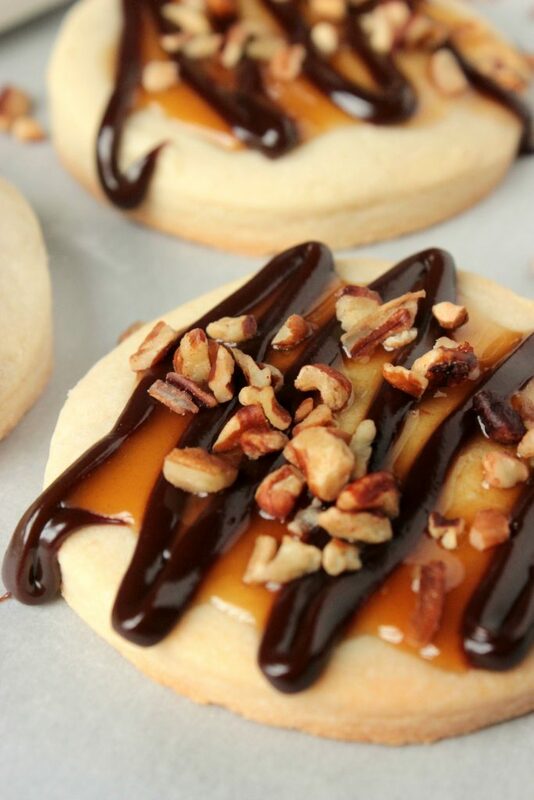 It’s all about Turtle Shortbread Cookies today on the blog! Shortbread cookies on their own are not super sweet cookies. Actually I don’t think they are sweet at all, so the chocolate sauce and caramel is the perfect touch for these! The dough take a little patience to make, but once they’re baked and cooled the rest of the work is easy peasy! Oh and don’t worry, the shortbread cookies aren’t hard to make! It just has to sit in the fridge for a little while. Now let me tell you. The first time I made shortbread cookie dough I thought that I had totally messed it up by placing it into the fridge. When you take it out of the fridge, don’t freak out if the dough is crumbly! It’s ok! Just take a little bit at a time and work it together with your hands. The heat from your hands will make it come together. Also, to cut these shortbread cookies out, you can use a round cookie cutter if you have one but to be honest, I can never find mine. So I used my grandmother’s old biscuit cutter to cut out my shortbread cookies when I make these. Also, let me point out that THESE Turtle Shortbread Cookies are not really stack-able. 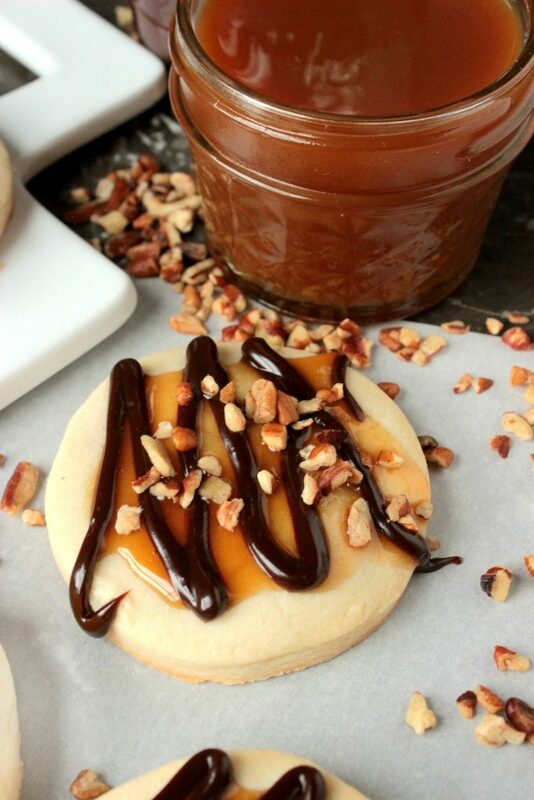 The caramel is smooth and tacky and the chocolate sauce may stay sticky! 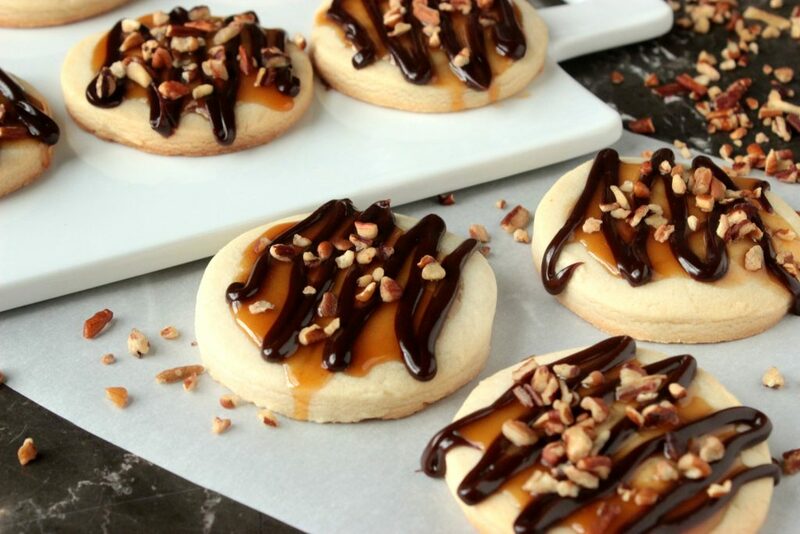 However if you want to make these Turtle Shortbread Cookies stackable, like for a cookie swap or a party. Just use caramel melts and chocolate candy melts for your drizzles and let them harden before stacking. Either way, you’re going to love these. I am the same way! 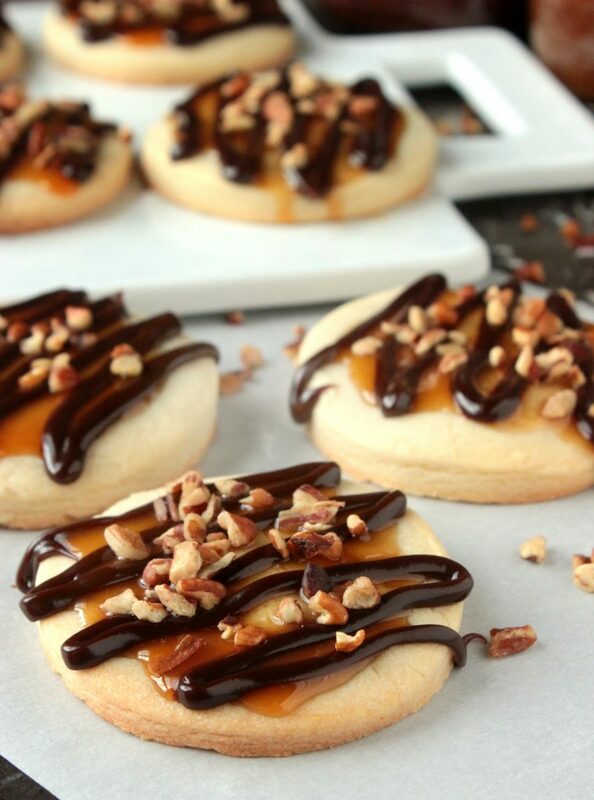 My husband loves sugar and shortbread cookies but I am a chocolate lover to the core! These look like the perfect blend! thanks for shearing the post and am a big fan of the chocolate cookies as well i will have make this cookies.